Byzantium - This tiny little colony, founded in 657 B.C. 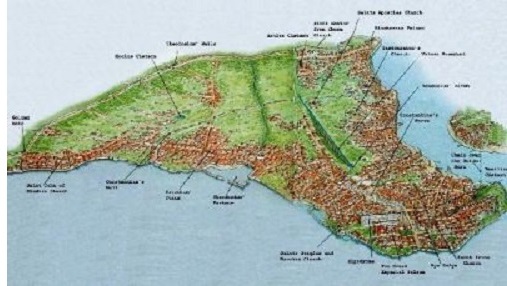 by a Greek named Byzas from the city of Megera, would eventually grow into one of the most important cities in the world, thanks primarily to its ideal strategic location along the European side of the Bosphorus at the mouth of the Black Sea. Centuries later, as the Western Roman Empire was in decline, Emperor Constantine moved his capital here and the city became Constantinople, named after the emperor himself. It would endure for over a thousand years until it was conquered by the Ottoman Empire in 1453 and renamed Istanbul.